Regenerative therapy involves delivering specific types of cells or cell products to diseased tissues or organs, where they will ultimately rebuild and restore their counterpart tissue and organ functions. FFVC is cellular material freshly made from special organs with high biologic activity and maximum safety. Your physician will review blood work as well as full medical history and physical (H&P) to determine an individualized treatment plan. Once the procedure is completed, your physician will review your results. 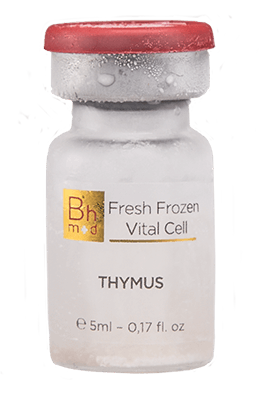 FFVC contains all of the biologic information of functional organ units like thymus, liver, brain and others. FFVC also contains bioactive substances like substrates, enzymes and transmitters: everything the cells need to function properly. They will regenerate and revitalize diseased organs. To be prepared according to your physician recommendation. Individualized therapy for optimal effect. Medical history and blood work are required prior to treatment. Our cellular components are separated before the ultrafiltration processes. Heavier elements such as cellular membrane and the nucleus are separated from the rest of the organelles. This results in the removal of DNA and reduces risk of allergies tremendously. Ultrafiltration is the process of multi-steps filtrating membranes, separating extremely small particles and dissolved molecules. Our ingredients are ultrafiltrated with a cut off of less than 10kDa molecular weight (approx. stokes radius of less than 2 nanometers). This process ensures that all proteins and cellular material are preserved and reduced to nano-particles macromolecules for maximum absorption. As a fact, the world’s smallest virus is 17nm. With ultrafiltration to < 2nm, it also results in the total removal of any bacteria/viruses and other impurities.